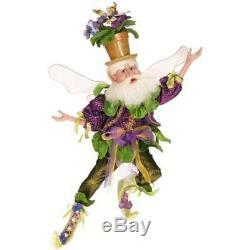 Mark Roberts fairies, African Violet fairy, 51-01932 medium 17 inches. Includes a certificate of authenticity and registration which records your name as the original purchaser. Mark Roberts is a beautiful line of Limited Edition collectible Fairies, Santas & Elves You will also find Halloween and other Christmas decor. We carry some items that are retired from previous years as well as newly released editions. Mark Roberts also believes in supporting many charitable causes and makes collectibles to support those causes. Mark Roberts means exceptional quality from the fabric and trimmings to the unique faces. The figurines are flexible so that you can pose them they way that fits in best with your display. The item "Mark Roberts Fairies, African Violet Fairy 51-01932 Medium 17 Inches" is in sale since Monday, July 16, 2018. This item is in the category "Collectibles\Holiday & Seasonal\Christmas\ Current (1991-Now)\Figures\Other Curr.ty" and is located in Parrish, Florida. This item can be shipped worldwide.